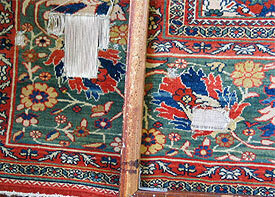 Antique Rug Company has served Pasadena’s Persian rug repair needs. 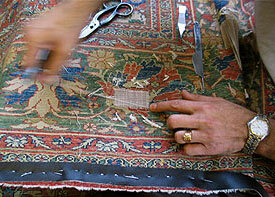 Contact our repair workshop to bring your rug in for in person inspection or schedule a pick up by our crew. Persian and other handmade rugs are works of art. Antique, old, vintage, collectible, family heirloom or new, all rugs ought to be maintained and cared for as they are used over the years. 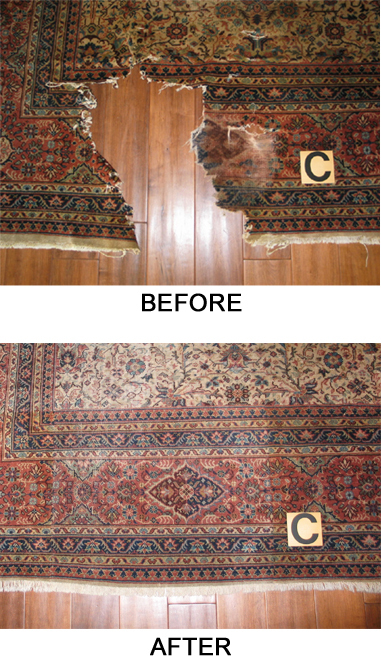 To help you with maintaining of your valuable rugs we have outlined suggestions at our RUG CARE menu. Accidents happen and sometimes rugs are damaged. It is best to seek professional advice to repair or restore damage early as additional losses may occur. Our experienced rug weavers and restorers at Antique Rug Company provide you with best maintenance, repair and restoration options available. 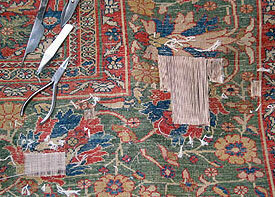 We can repair any handmade or machine made area rug, whether be Oriental, Persian, Navajo, mechanical or other type.